Protein toppings of your choice; eggs, fish, chicken, etc. Bring coconut milk, water, oats, and pinch of salt to a boil. Boil, stirring often until desired thickness, about 10 minutes or so. While the oats are stewing, prepare your greens in a bowl, drizzle with oil and vinegar and salt and pepper. 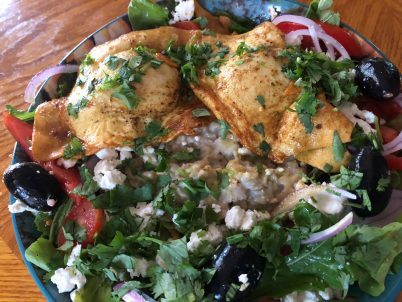 Scoop the oatmeal on top of the greens, top the oatmeal with cheese, olives, and cilantro, top with your protein source, and sprinkle with cilantro. Oatmeal is a very healthy food loaded with fiber, however the way most people eat it (for breakfast with sugar) makes it a blood sugar nightmare … Here is a very healthy way to eat this delicious power food. Base Recipe : Bed of greens and salad veggies drizzled with olive oil and nice vinegar of your choice, sprinkled with pumpkin or hemp seeds. Top that with the oatmeal as made in the main recipe. #1 Sauteed Kale, red onion, yellow tomatoes, Hummus drizzled with pesto, and a sprinkling of Pecorino cheese. #3 Avocado sliced, sweet pepper, poached eggs. #6 Sauteed together Kale, zucchini, and spinach, topped with scallions and dill. #7 Sauteed mushrooms and spinach, topped with eggs of some type and red pepper flakes. #9 Kale sauteed with ginger and chilies, tamari, sesame seeds, hard boiled eggs.